There will be more posts featuring photos from our trip, but for today I'm sharing what's happening closer to home - in the garden. The tight buds that were appearing on the dahlias when we left have opened to full and beautiful blossom. The fuschia plant I put in this year is producing masses of dancing flowers. In Spanish the fuschia is known as "aretes" which means earrings. They do look like fancy, dangly jewelry, don't they? The potager is producing well - this is representative of what I'm harvesting every three days or so. Temperatures have cooled off a little, although I hear more heat is coming. Dinner last night was spinach souffle with a green salad. I picked a bouquet of roses for the house. 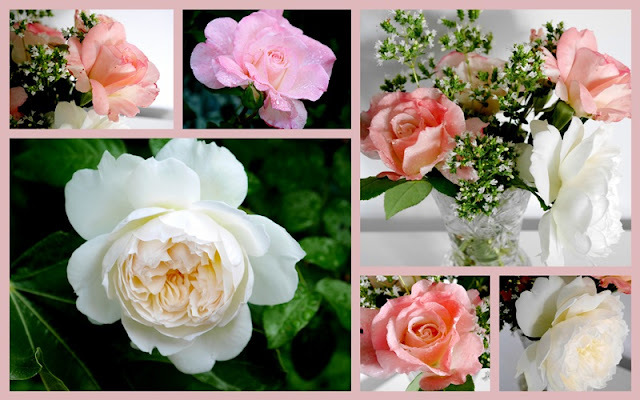 Although the pink rose in the above photo is the same as the "coral" ones, lighting indoors and out makes a huge difference. For filler I used some oregano stems that are in flower just now. I'm experimenting with growing quinoa this year. The stalks are tall and the seed heads becoming dramatic in shades of pinks and golds. The time to harvest is after the leaves fall off the stalks. They are turning yellow now, so I expect we'll be figuring out harvest plans in a few weeks. I'd welcome advice from anyone who has grown quinoa. What's delighting you this August? Linking with Mosaic Monday hosted by Judith of Lavender Cottage. That is a delightful August! Really great garden photos. The produce is beautiful, as are the roses. I'll be interested to see the quinoa harvest. What an abundance of beauty in your garden and harvest. Lots of healthy eating! I love fuchsia flowers! They, and columbine flowers, always remind me a dancing ballerinas. Your garden is producing well. Your souffle looks delicious! I have not made a souflee in a long time and you have inspired me, Lorrie. I am enjoying the frfequent afternoon thunderstorms we've been having and visiting many state parks this August. My oldest grandchild goes back to school tomorrow---too soon! Lovely shots from your home and garden. If you like you can link up on the all new edition of the "Through my lens" photo meme. Link is below. What a wonderful harvest from your garden, Lorrie. And what perfect souffles! The veg from your potager makes a beautiful 'still life'...hard to beat roses,of course, but really attractive even so. I didn't know that is what quinoa looks like when it's growing! I learned a new thing! All that rain you had, I think it has done wonders! Such a delightful post, Lorrie! 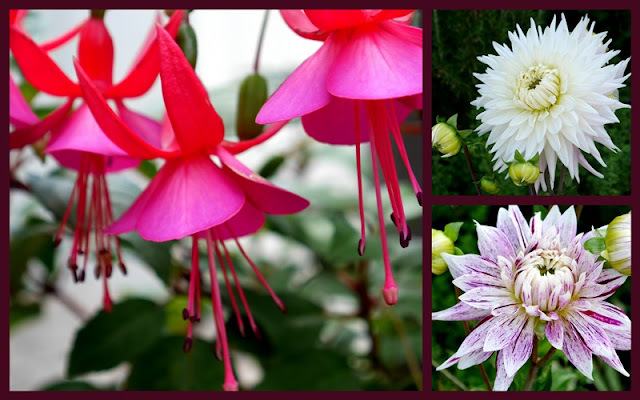 Your flower mosaics are wonderful and your pretty fuchsia flowers make me think of fairies dancing. Your vegetables and spinach souffles look delicious, of course, and I'm looking forward to seeing the quinoa harvest and how you will use the crop. How PRETTY, Lorrie!!! I adore your roses & will be anxiously watching this post to hear more about using the quinoa. I didn't know we could grow Quinoa around here, I'm curious as to how yours turn out! Beautiful photos Lorrie! Hello, your veggies are looking beautiful, what a great harvest. I love the beautiful flowers and roses. I wish I had a good spot for the fuchsia to grow, it is pretty. Lovely post, enjoy your new week! Wow! I've never seen a quinoa plant before. Beautiful photos! Wow you've got quite a garden growing there. Love the pretty flowers. I've never seen Quinoa plants either. How cool you are growing them in your garden. So much beauty. love photos. thanks for sharing with us. I don't know which is more beautiful, the flowers or the veggies! What a green thumb you have! Hello Laurie, your harvest photos are wonderful and the roses are so gorgeous. it looks like you have had an amazing summer! How interesting to see your quinoa growing. I do enjoy eating it but haven't given much thought to how/where it grows. I hope you will keep us posted on your experience with it. When we visited your lovely island the dahlias at Butchart were in their glory. I will always think of them when thinking of Vancouver Island. Yours are so pretty too. I didn't know that about fuschias. Now that you mention it they do look like earrings. Your spinach souffle is almost too pretty to eat. I can imagine it tasted heavenly. Lots of harvest from your potager - what kind of beets did you grow that are long? Mine are little round balls -Dutch 'Red Barons'. I checked my vegetable gardening books and quinoa is not listed in any of them, do you have Master Gardeners in your province that could help with the details of harvest? Thanks for linking to Mosaic Monday Lorrie. What beautiful images! I was intrigued by the quinoa shot and never realized that they exhibited such interesting colours while growing. August beauty... Veggies and flowers! My garden is languishing in the heat, but has been a source of delight this summer. Please share more about your experience with quinoa... Great photos! I think one of the very best things about summer is the harvest, whether flower bouquets, or veggies from the garden. I've never seen quinoa grown, I'll be interested to see how you harvest it. Lots of beauty and bounty in your garden...the quinoa is so interesting! didn't know you could grow it in a home garden or what the plant looked like, etc. I am late getting around this week. My, what a lovely post with such beautiful garden photos. Love the roses, but I am really curious about the quinoa. I've only prepared it once, so I have not idea about growing it. I didn't even know that it could be grown at home. I figured it to some exotic plant from Somewhere Else. Do let us know the outcome. Your garden is lovely and you vegetables very healthy looking. Your potager is exceeding mine...looks yummy! I have so enjoyed your travel posts. Oh those bears! Your potager is indeed quite the producer. My roses are just barely hanging in there in this Texas heat. Your spinach soufflé looks amazing as does your bounty from the garden! I imagine they grew quinoa in Peru? Or is it Chile? I know it's South America. What a lovely crop you have! The vegetables look delicious. Your quinoa looks good! It sounds like an interesting plant to grow in you potager. Great looking veggies there Lorrie - you do have a green thumb! The quinoa is interesting, I've never seen it growing before. The soufflé looks delicious - perfect for a summer's eve supper. Beautiful flowers! Thanks for sharing them with us. Looks and sounds like your garden is doing great, and the souffle looks so good. Yummy looking late summer produce from your garden Lorrie - do tell me what you will do with the quinoa. The long beetroot looks an interesting variety to grow. I have a long dental appointment tomorrow to have two new crowns put in place so Spinach Souffle sounds like the perfect dinner for us - your souffles look amazing!